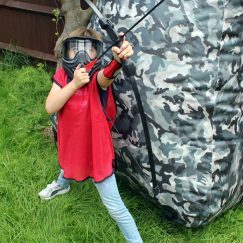 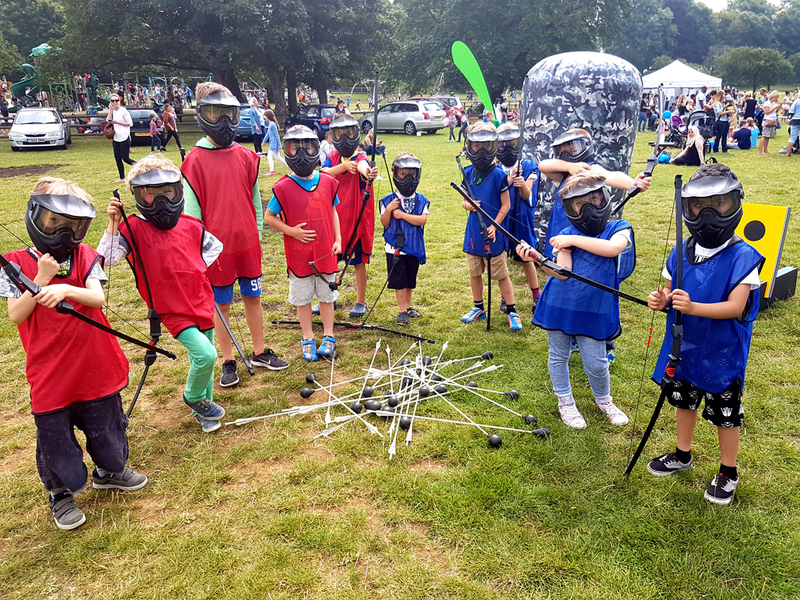 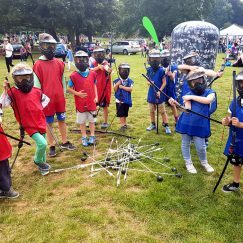 Bow Arrow Tag is a new exhilarating, safe and family friendly combat archery adrenaline sport that can be played indoors (soft play venues, gyms and halls) or outdoors (fields, parks, woods or beaches). 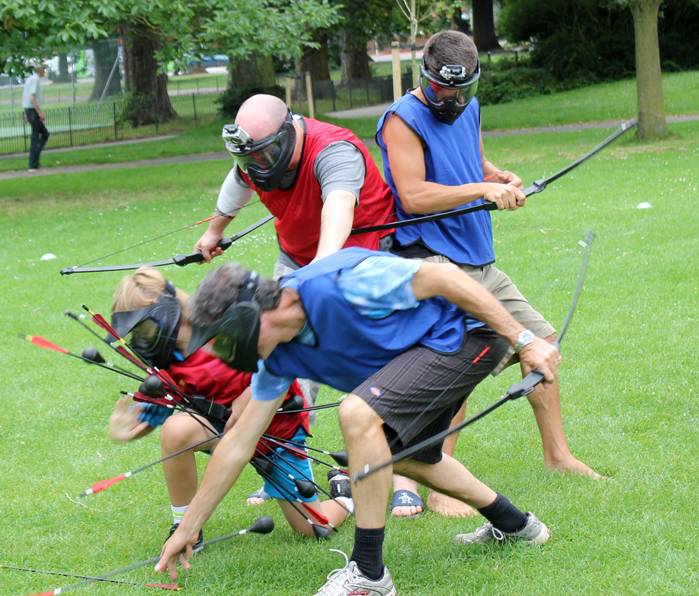 Players use short bows to shoot ultra-safe foam-tipped arrows at the opposing team members on the field. 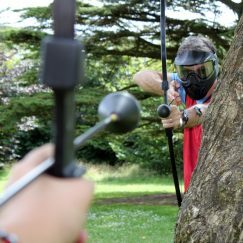 Think dodgeball, but with a bow and arrow, this fast moving, action packed game is sure to get the adrenaline pumping. 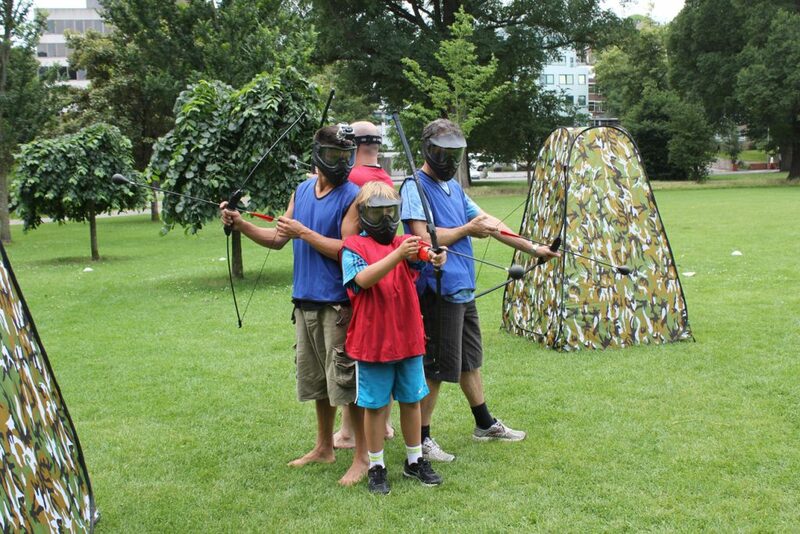 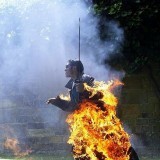 Some would say it’s a bit like paintball without the pain, bruises or welts. 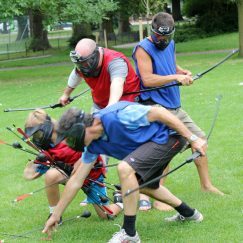 It’s the ultimate team sport and promotes teamwork, self-confidence, communication, leadership, fitness, tactical thinking and is just outright great fun. 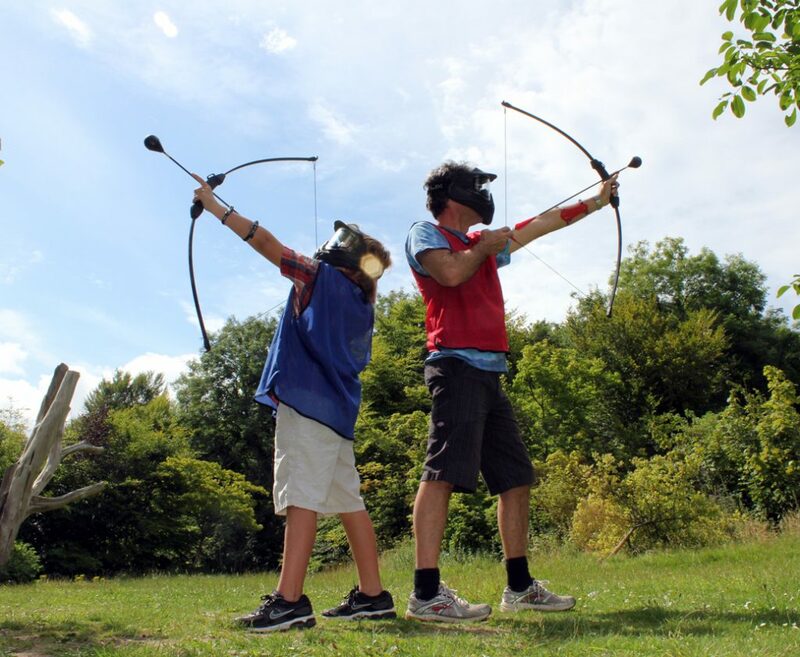 All the equipment is completely mobile so you can come to us or we can bring it to you. 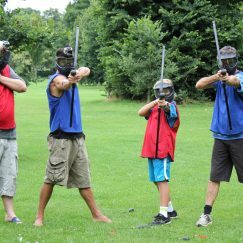 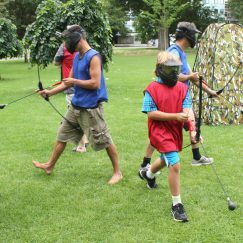 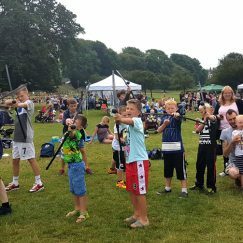 Players do not need archery skills of any kind to play, just the want to play with bows and arrows; it’s simple, safe and fun for all ages! 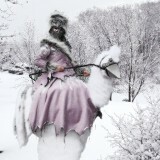 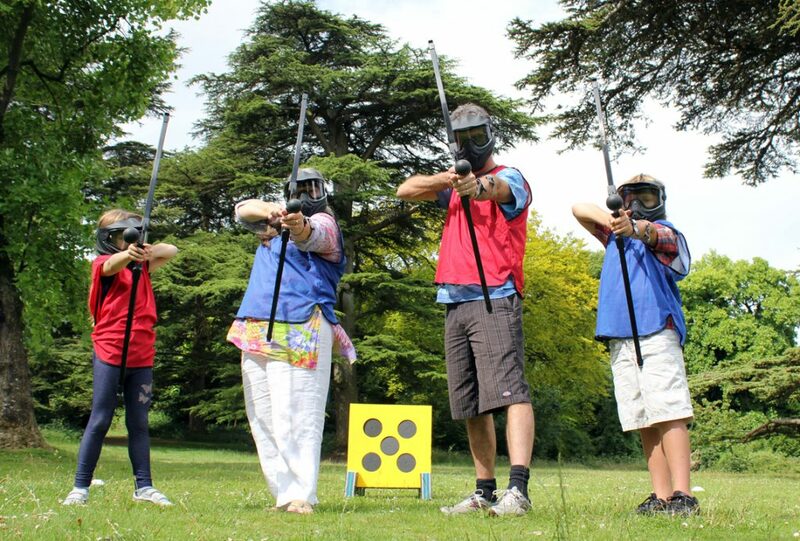 Enjoy with friends, family or colleagues at work. 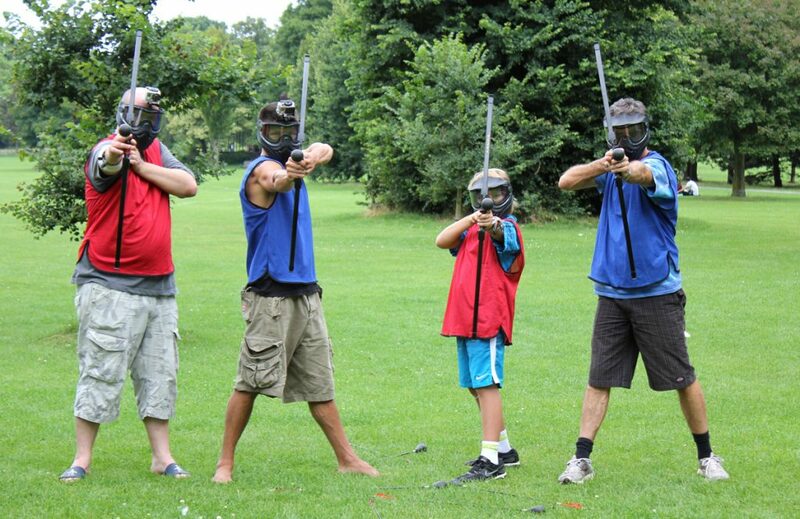 We also run a weekly team based competition on Wednesday nights. 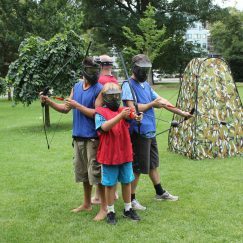 Enter your team of 6 now or register as a single player and we will find a team for you! 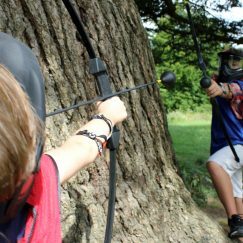 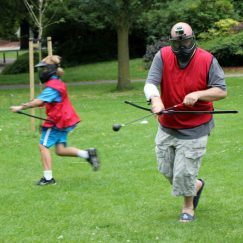 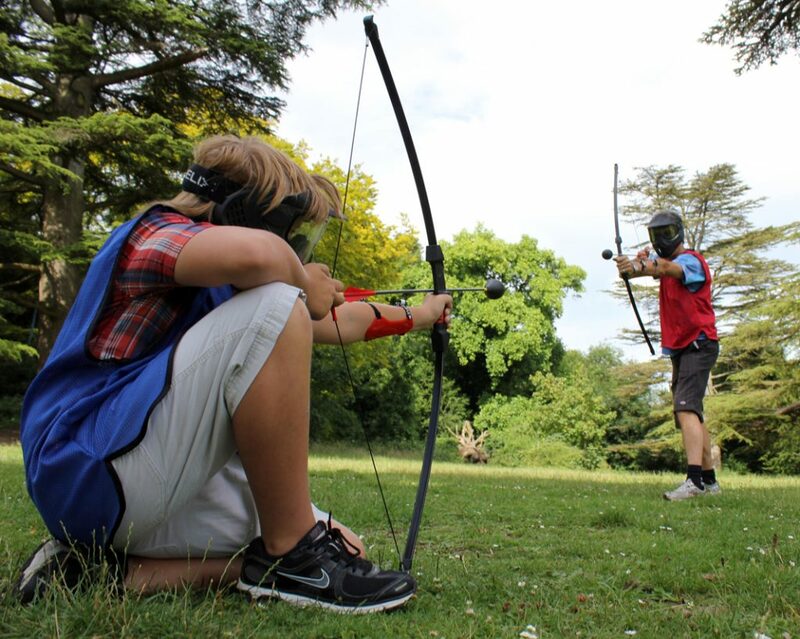 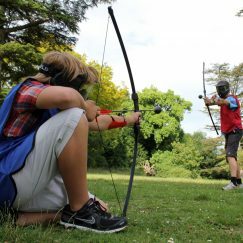 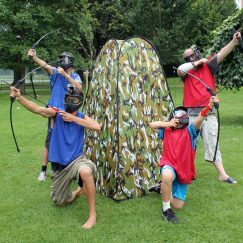 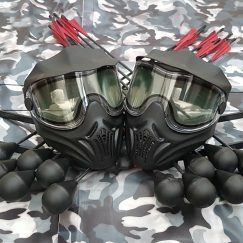 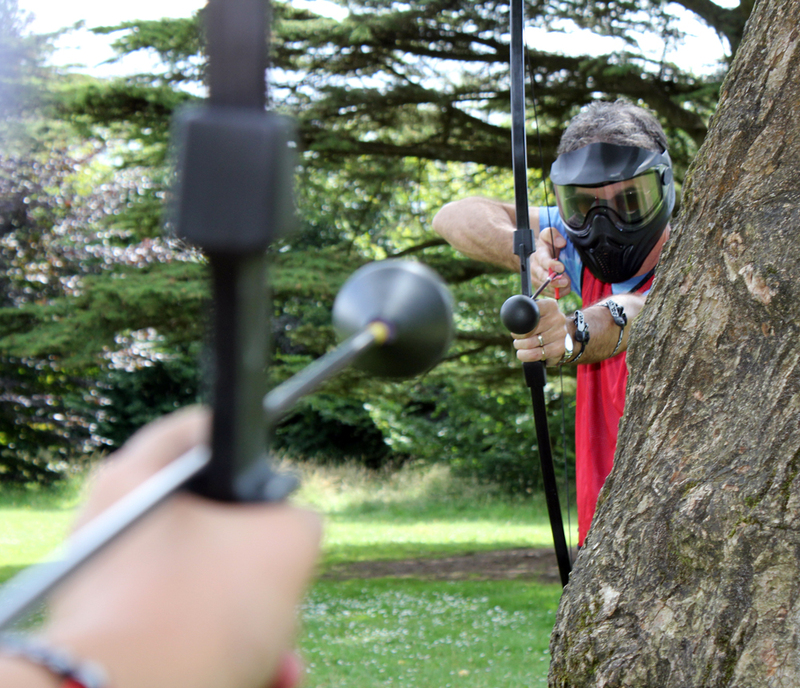 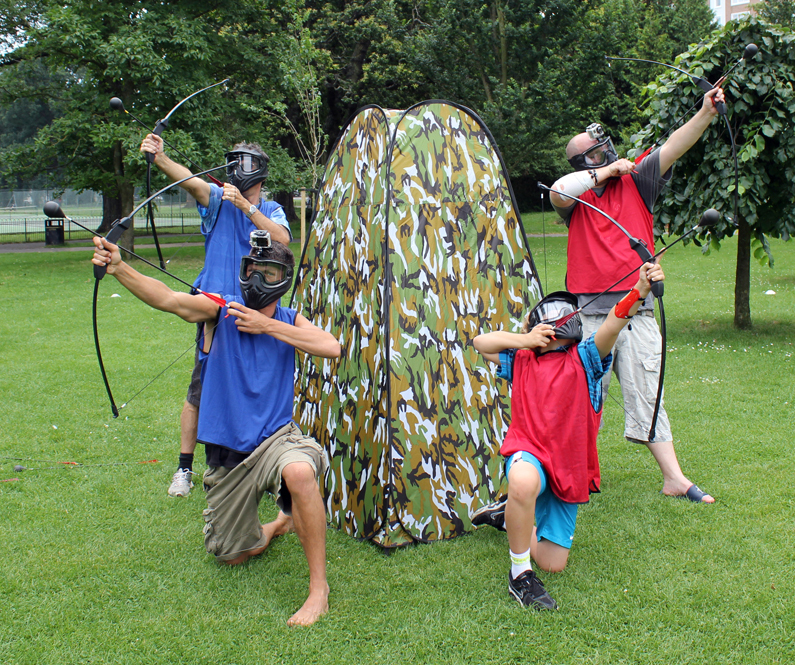 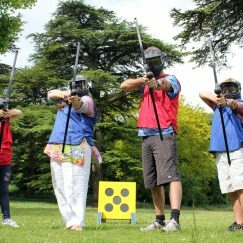 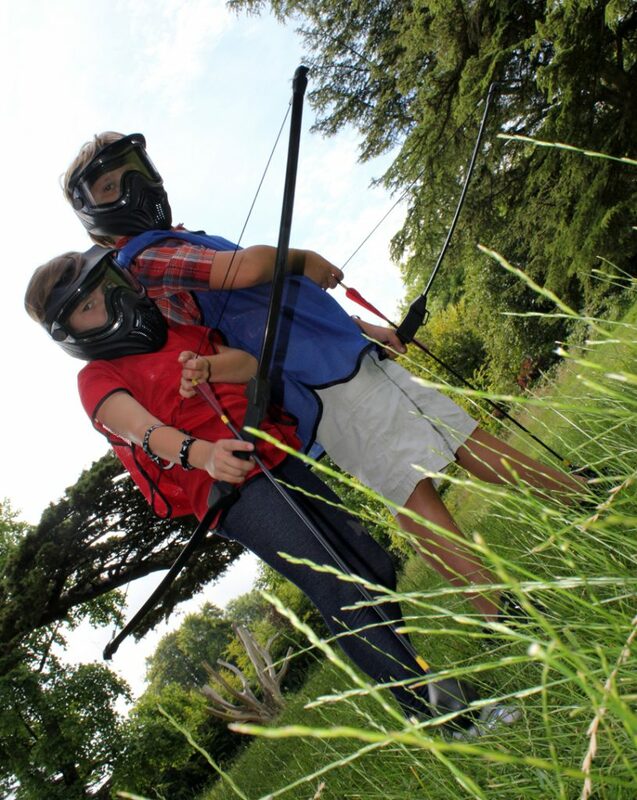 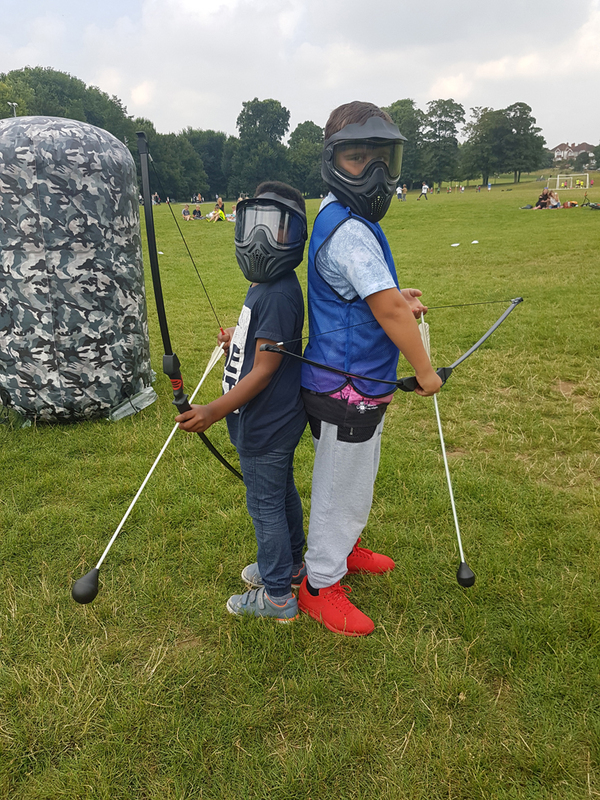 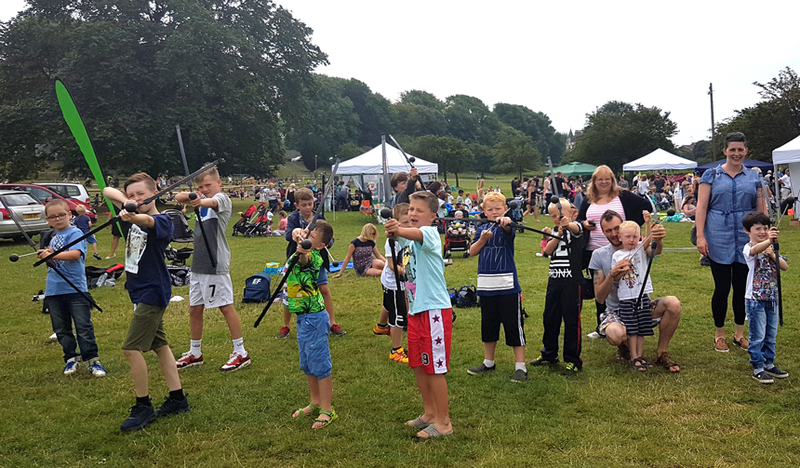 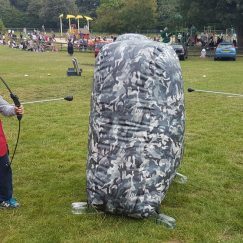 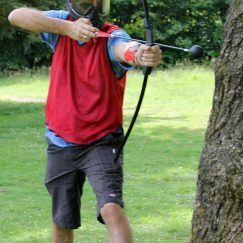 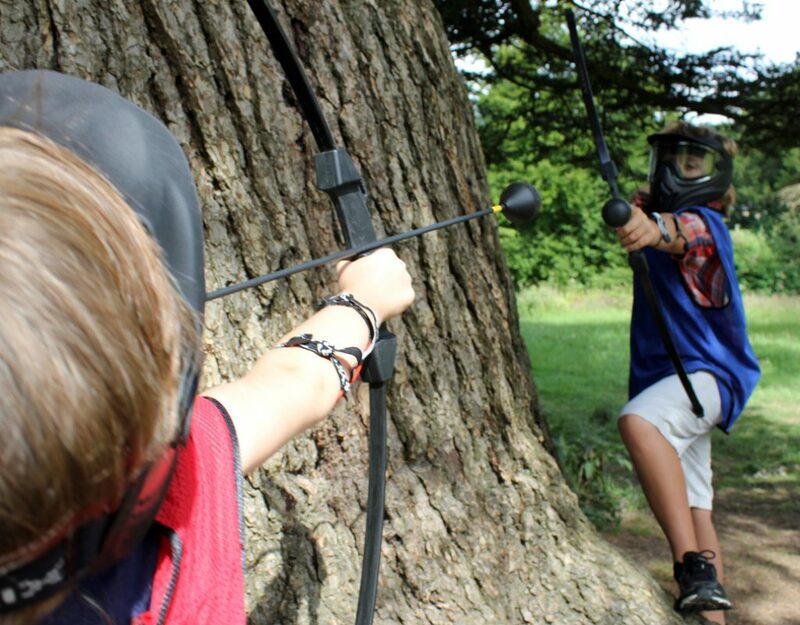 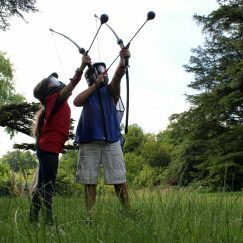 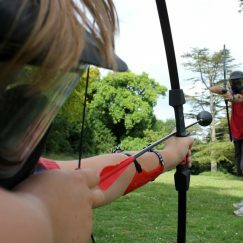 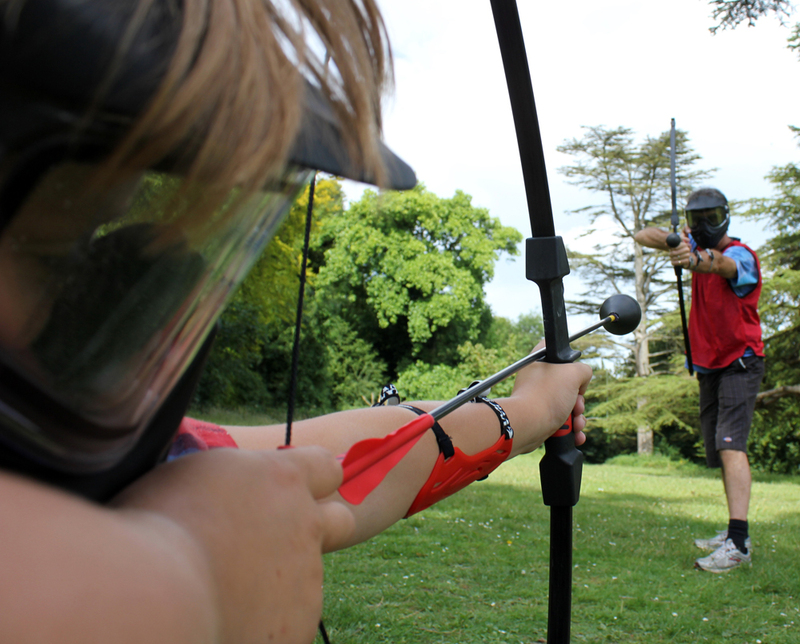 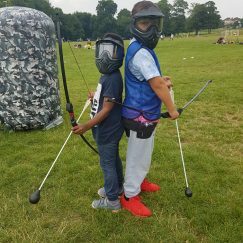 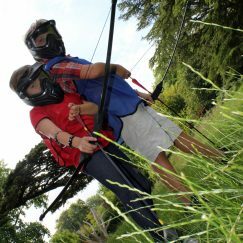 Bow Arrow Tag is perfect for the following events; Robin Hood or Medieval themed events, corporate events, private parties for children and adults, fairs, festivals, stag and hen events, scout groups, church groups, family functions and corporate team-building events. 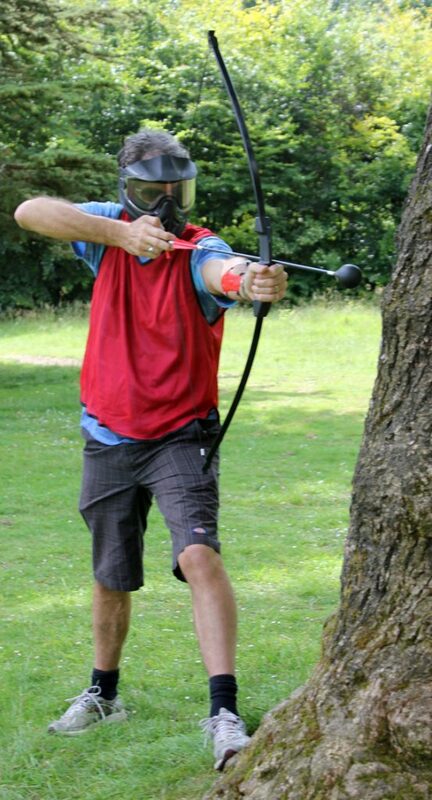 Bow Arrow Tag can be played indoors (tennis courts, halls, conference rooms, soft play venues, barns, etc.) 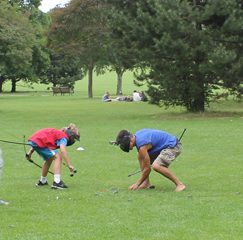 or outdoors, (parks, playing fields, beaches, woods, car parks, etc. 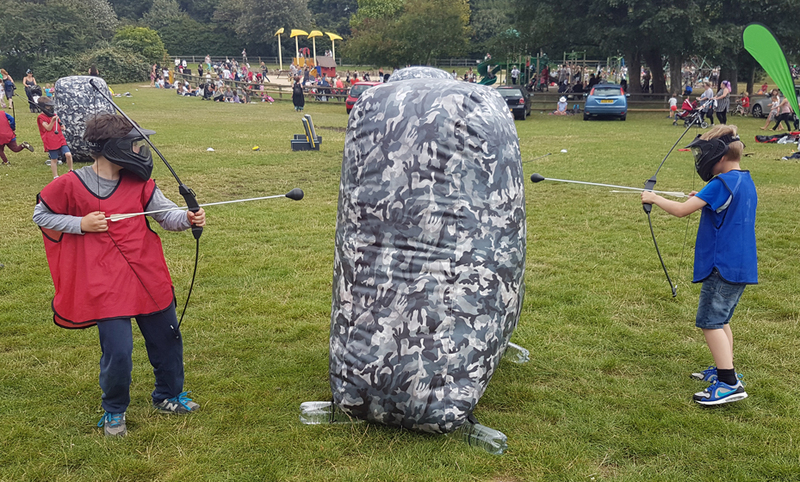 We can even play in the rain). 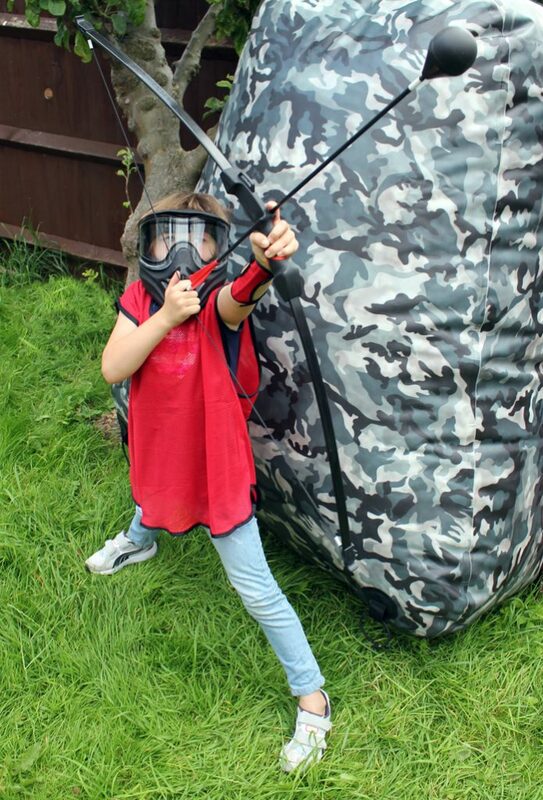 The playing space needed is 20 meters x 30meters. 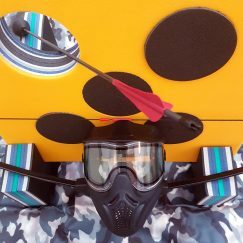 (About the size of a tennis court). 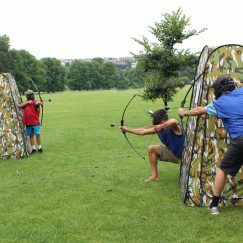 Once safety is taken care of, all the players are given their Bow Arrow Tag equipment. 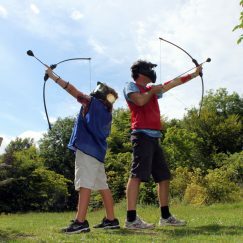 They then practice for 10 minutes by shooting targets and getting to know the bows and arrows. 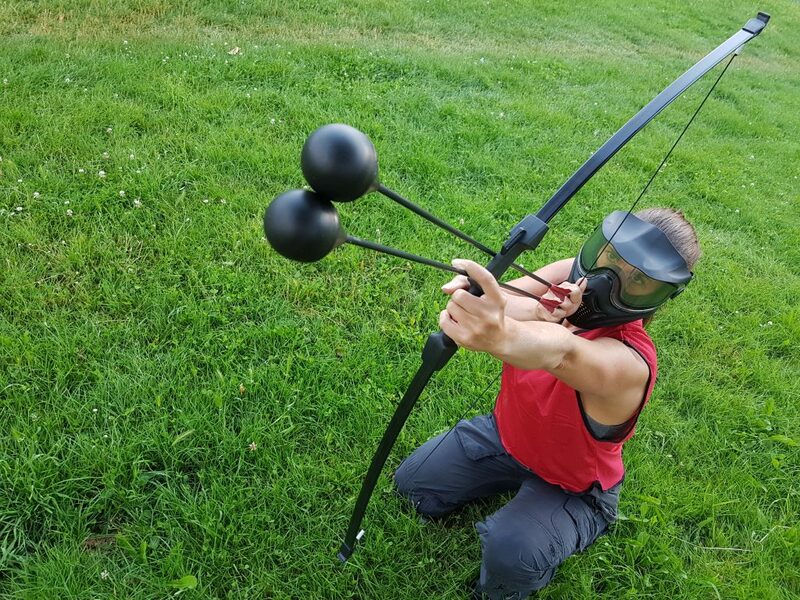 After the training is complete its time to play. 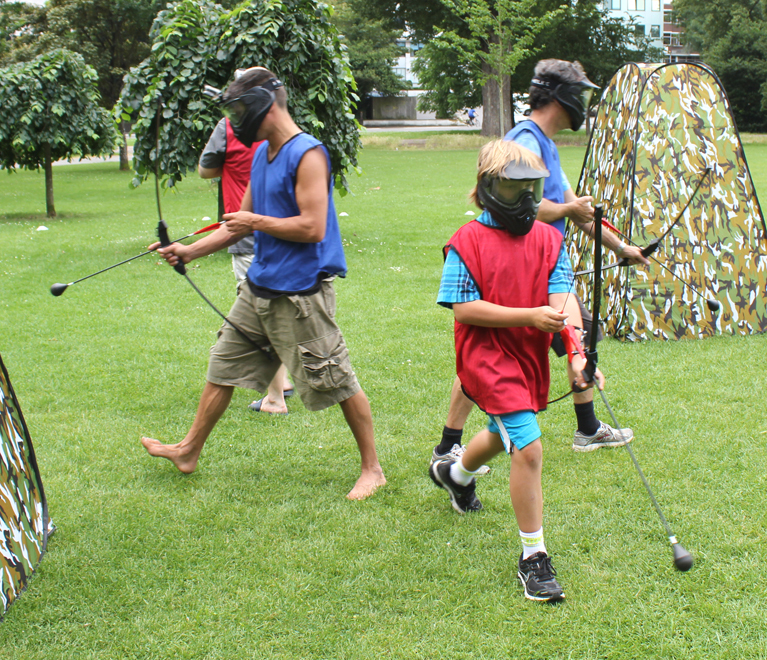 The group is divided into two teams and games are played for the remaining time. 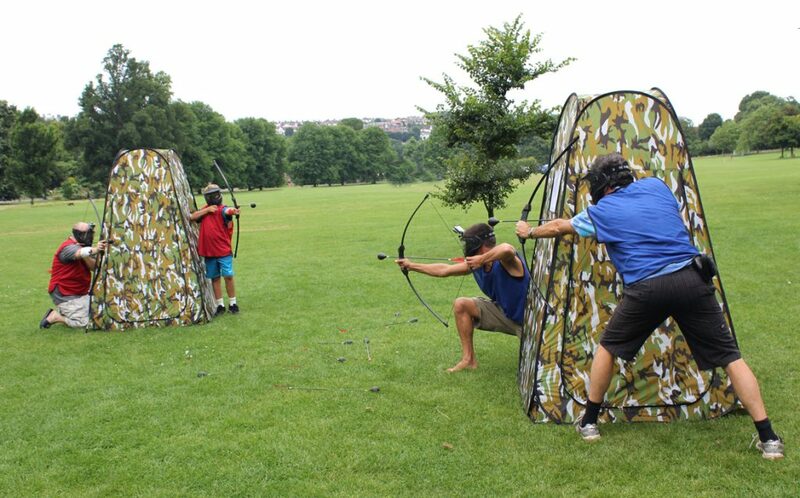 There are many games to choose from and the Bow Arrow Tag Marshall will be sure to keep everyone busy having fun. 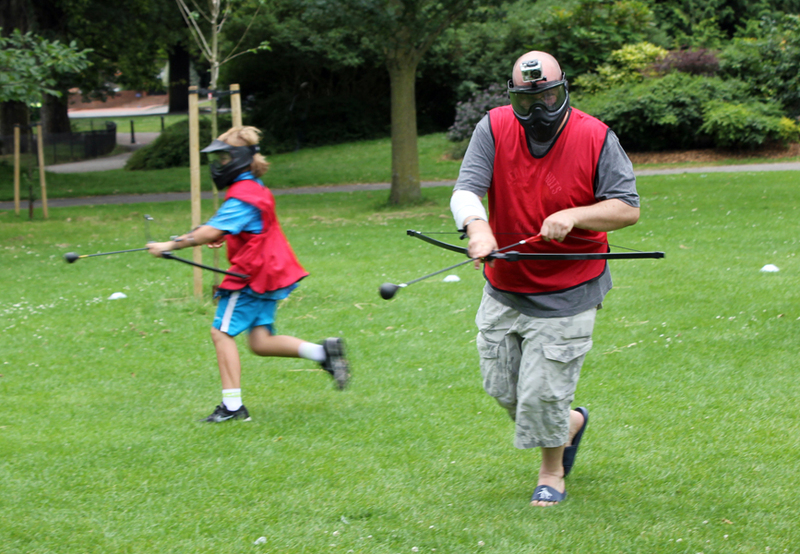 Games last between 5-10 minutes long. 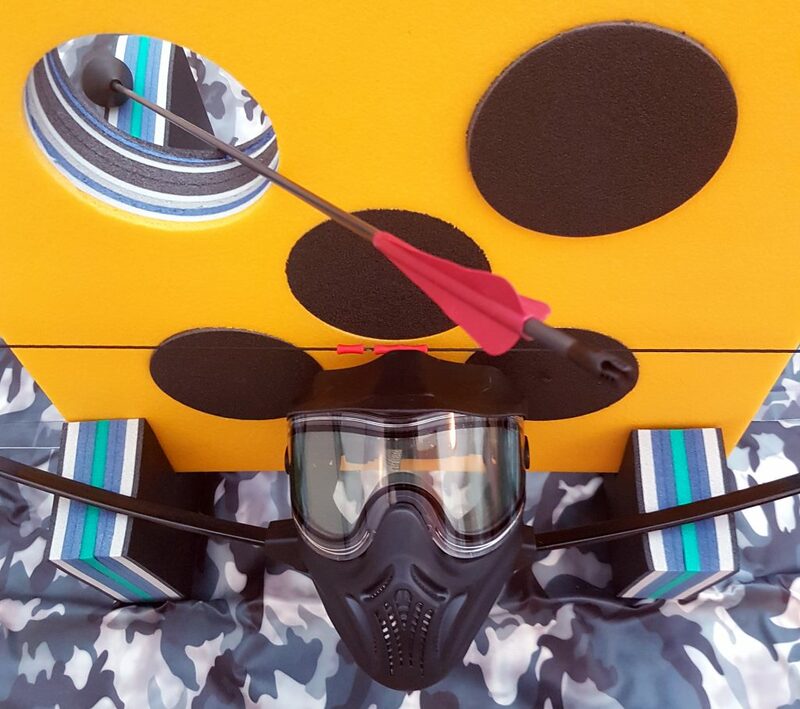 When the time runs out the Marshall will blow the whistle and pack everything up. 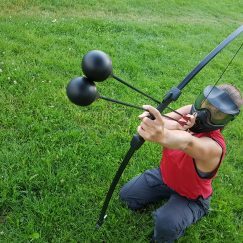 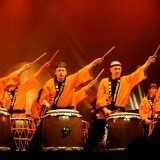 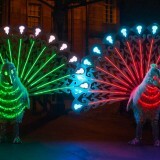 30 Minutes Required for Setup & Takedown Combined (2 Hour Location Booking For 1 1/2 hour Party Package).